9. In Spain, Queen Letizia wore a new pair of earrings to deliver the Gold Medals of Merit in Fine Arts on Wednesday. 8. Queen Maxima of the Netherlands wore pendant earrings with pink stones to speak about financial inclusion in Washington, D.C. on Tuesday. 7. Last week in The Hague, Maxima donned her dramatic spider brooches (which were almost hidden by her hair) and glitttering hoop earrings at a financial support workshop for women. 6. Queen Silvia of Sweden wore diamonds and rubies in Paris at an event for the Swedish Chamber of Commerce on Monday. 5. For the final day of the Commonwealth Heads of Government Meeting in Malta, Queen Elizabeth II of the United Kingdom wore her turquoise and diamond brooch, which was one of her apparent debuts last year. 4. 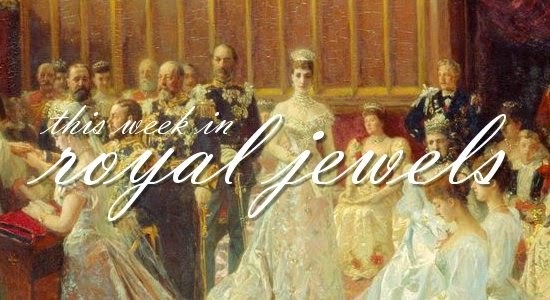 On her arrival in Malta, Elizabeth selected a very important piece of jewelry from the vaults: the sapphire and diamond Albert Brooch, Prince Albert's wedding gift to Queen Victoria. 3. Elizabeth offered up a bit of a jewel mystery in Malta as well, donning a diamond and aquamarine brooch that we've not previously seen her wear. 2. The Prince of Wales and the Duchess of Cornwall also traveled to Malta with the Queen and Prince Philip, and for the CHOGM banquet, Camilla brought out the Greville Tiara, her pearl necklace with the large diamond and pink topaz clasp, and a lovely pair of pink topaz earrings. 1. Camilla almost won for me this week, but how can I pass up Queen Elizabeth II in the Vladimir Tiara with the Cambridge emerald drops, plus the necklace and earrings from the Delhi Durbar parure?